Seeds are amazing powerhouses of energy and nutrients. 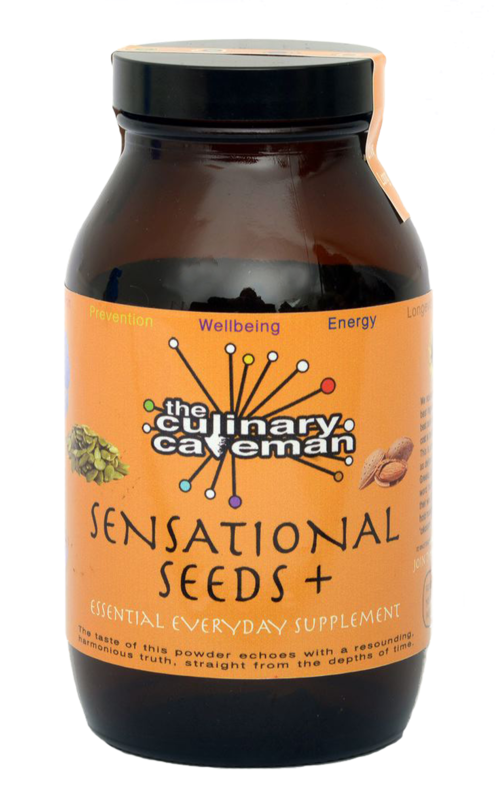 Sensational Seeds + was formulated because the vast majority of the public are deficient in so many of the minerals and vitamins found in abundance in this powder, which needs to be eaten everyday, by everyone. Much more than just seeds, as one should expect from the Culinary Caveman. Sourced from mineralized soils, fresh, chemical-free, hand-blended and balanced to help Unlock the true power of Gaia. This mix is not only rich in Omega-3, each jar has over 60g of low-temperature dried fruits (which equals half a kilo of fruit when reconstituted) with about a gram of pure vitamin C. Both of which have been scientifically shown to help with disease prevention and inflammatory conditions, lubricating joints, as well as feeding the hormone system, can help with depression, the skin, hair, eyes and libido. Equals Sensational Seeds with a very large +. Vitamins – B1, B3, B6, B9, C and E.
Omega-3 and loads of Phytonutrients.